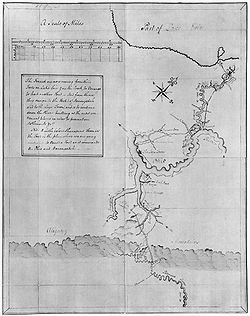 The Battle of Jumonville Glen, also known as the Jumonville affair, was the opening battle of the French and Indian War fought on May 28, 1754 near what is present-day Uniontown in Fayette County, Pennsylvania. George Washington had been sent to the Ohio Country, an area then under dispute between British and French colonists, as a British emissary in the winter of 1753-54 to tell the French, who had been building forts in the area, to leave. French officers politely told Washington they were not obliged to obey his summons, and they were going to stay. In Europe, the North American theatre of the Seven Years' War usually has no special name, and so the entire worldwide conflict is known as the Seven Years' War (or the Guerre de sept ans). The "Seven Years" refers to events in Europe, from the official declaration of war in 1756 to the signing of the peace treaty in 1763. These dates do not correspond with the actual fighting on mainland North America, where the fighting between the two colonial powers was largely concluded in six years, from the Jumonville Glen skirmish in 1754 to the capture of Montreal in 1760.